It’s more important than ever to be environmentally conscious, but how eco-friendly is your beauty routine? Just like true beauty begins from the inside, and how good we look on the outside often depends upon how well we take care of ourselves on the inside, looking after the planet begins on the inside too… with every thought we make and every action we take to make our world a better place. So why not start with your daily beauty regime and being mindful about the products you choose to make it happen? Here are our top tips for looking and feeling great while also helping to keep the planet beautiful! Take a look at your dressing table and bathroom cabinet and be really honest with yourself… how many of these products do you actually use, and how many of them are really necessary? Let’s face it, all your beauty routine needs is a cleanser, toner, moisturiser and sunscreen, and you only need one of each! If you’ve got a half dozen different products that all do the same thing, choose the product you like (after checking the ingredients to make sure it’s the most environmentally friendly) and donate what’s left over to family and friends. Also, try to use products that have multiple uses. A basic face moisturiser can often work equally well as an eye cream (unless you have extremely sensitive skin) and eyebrow pencils can make great eyeliners. 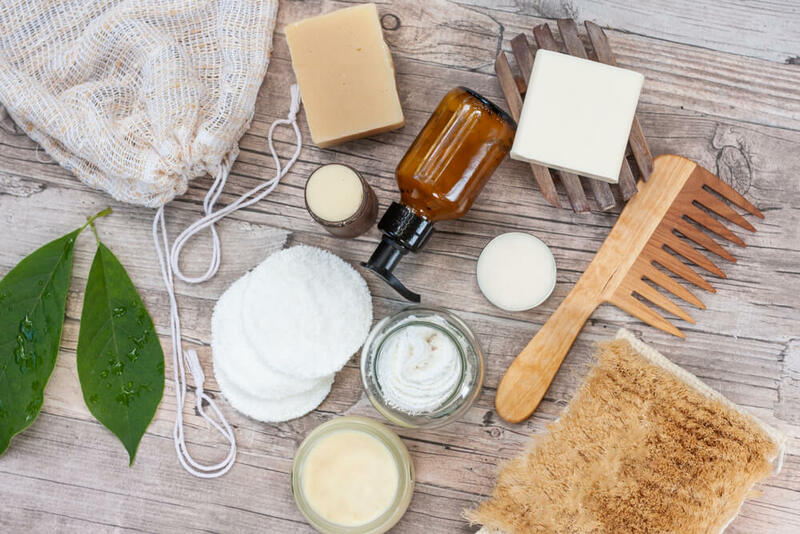 Ditching plastic packaging and choosing beauty products that are housed in glass will go a long way towards making your beauty routine more eco-friendly. Where soaps and shampoos are concerned, it’s even possible to lose the packaging entirely. Many shampoo bars are just as effective as bottled shampoo and usually far more economical because you won’t use more than you need. If you’re focused on saving money as well as saving the planet, buying your beauty products in larger containers and then decanting the contents into smaller glass bottles can be useful too. Ditch the face wipes and cotton pads. Using a cleanser with a flannel or eco-friendly sponge is much better for your skin (although make sure you wash the flannel regularly) and won’t clog up our oceans and landfills. But, if you can’t bring yourself to lose face wipes and cotton pads entirely, try to buy biodegradable face wipes and look for cotton pads you can put in the washing machine to re-use again. Oh, and use cotton buds that have paper stems instead of plastic ones. The increased popularity of veganism has had a massive impact on the worldwide beauty industry. Once upon a time, veganism was mainly seen as a way to eat more healthily while being ethically responsible, but times have changed considerably. Now, veganism is a lifestyle choice that even extends to the beauty products we use. More and more beauty products – from cleansers to lip balms and blushes to body lotions – carry a vegan certification, meaning they’re not only good for your body and for the planet, they haven’t been tested on animals and they’re also free from any kind of animal extract. Becoming an eco-beauty warrior is easier than you think! What changes are you going to make to your beauty routine today?